Last Game: Sunday in Hartford, the Penguins scored five goals in the second period and stormed back from a 5-1 deficit and beat the Hartford Wolf Pack 7-6 in overtime. Scott WIlson scored the game winning goal. For Binghamton, they hosted the Springfield Falcons and lost 4-3. The Falcons scored three straight power play goals in the third period. Last Meeting: October 28 in Wilkes-Barre, the Penguins won 4-3. 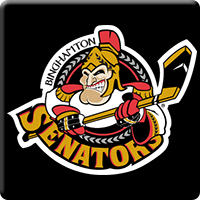 The B-Sens scored two power play goals, but J-S Dea scored the go ahead goal. Why you should care: The Penguins can make it a dozen wins in a row with a solid performance against a struggling Binghamton team. It’s a trap game for the Penguins. The Senators have struggled recently but they always match up against the Penguins well. Other Game to Watch: Tomorrow’s opponent Albany hosts the hot Springfield Falcons in a matchup of two soaring teams. Wardley activated and sent to the Wheel. That referee in that building….